This home shown on Lampkin ST provides a handsome example of elegance and charm of the turn of the century. A few years ago when we had open house at the museum hosting a new beginning, Attorney William “Bill” Stark was present and “spotted” an aerial view of Starkville with the photo of the “Page” House on Lampkin Street that he purchased and had moved to their property on Highway 82 West. He asked for a copy of the photo as a reminder. Next, a precious” lady, Shirley Carley, gave the museum a copy of some of her back articles. As you remember, she was the very talented writer who wrote about Starkville. Among her articles in 1974 was one entitled “Page Home Stands as Reminder of Starkville’s Past.” She wrote the article when the home was still standing on Lampkin Street. Carley wrote, “Tucked away among stately old trees and apparently unperturbed by the parade of progress going on around it, the old Page home on Lampkin Street stands as a handsome reminder of Starkville’s past. Surrounded by the trees and shrubbery, the house might go unnoticed by the casual passerby. However, once glimpsed, the beauty and charm of the structure often brings people back time and time again to admire its broad, graceful lines and picturesque designs. 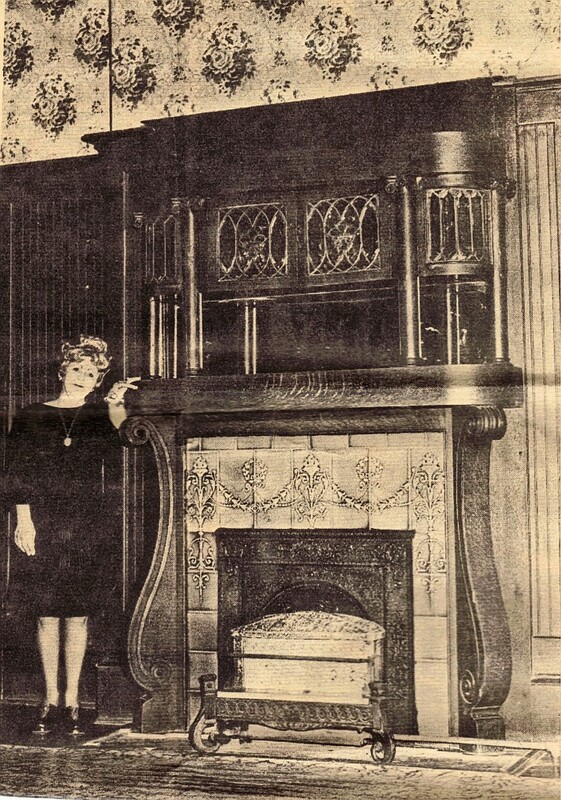 Shown is a unique fireplace – Mrs. Ted (Hilda) Bryan stands by one of the nine fireplaces in the home. This fireplace is in the dining room and the leaded glass doors on the cabinet above the mantel enhance its beauty. The home now belongs to Mrs.William Dabney Peeples and Mr. And Mrs. Ted Bryan. They purchased the house in 1945 from Wilburn Page, great nephew of William Oliver Page, who built it in 1898. Oliver Page’s parents, John Gutherie Page and Eliza Letcher Phillips Page, settled in Oktibbeha County in the early 1850s, having made the long journey from their home in Virginia by covered wagon. A landowner, “Ollie” Page was in the cotton business in Starkville. He and his wife had eight children, one of whom died as a small girl. A son, Sam, died at 19 from typhoid fever. The other children grew up to be leading citizens of the city. Son Curtis Page was a farmer and served as a county supervisor for 30 years. Frank and Archie were farmers, and Walter became president of Peoples Bank. The two daughters, Miss Fannie and Miss Leila, lived on in the house after their parents died until around 1936, when they sold it to Wilburn Page. The only surviving child, Miss Leila, now lives in a nursing home in West Point. From 1936 to 1945, the home was rented to a family who ran a boarding house there. Time has not dimmed the luster of the wood or the elegant lines of the stairway or the handsome carved fireplaces. Probably the most charming room of the house is the dining room. Here the original gold and green finish on the solid oak ceiling beams in still evident. The 12-foothigh walls are wainscoted in beaded ceiling panels topped with a plate rail. The unusual fireplace has a stunning cabinet with leaded glass doors above the mantle, and the green tile surrounding the fire opening adds a bright touch to the dark wood. On the wall opposite the fireplace is a massive built-in china cabinet with leaded glass doors above and rows of drawers below. W. Overstreet, a Jackson architect, designed the home. Twenty-nine railroad cars of long-leaf pine lumber from South Mississippi went in to the construction. Elegant rails and posts dominate the spacious entry hall. And the second floor landing, the door leading to the back porch is flanked on the left by two windows. Above the windows and the doors are unusual stained glass panels of green and gold torch designs. The full attic is a modern architects dream with its peeked ceiling and solid beams. Twenty-seven steps lead from the attic to the roof observatory, a flat platform which at one time was enclosed by a railing. Leaded glass windows, still boasting the original panes, border the massive oak front door. Everything in the house reflects the care and attention to detail that went into its buildings. Mrs. Bryan said she had been told that there was not a single knothole in the original lumber. Family sources say that five magnolia trees were planted on the front lawn when the house was built. One remains to the right of the sidewalk leading to the porch steps. The others were lost during the widening of Lampkin Street. The exterior of the home is so pleasing to the eye that artists often are seen sketching it. Wide steps of quarried stone lead up to the main porch, above is an identical porch on the second story. Both porches are outlined with sold railings that circle around to the side of the house, forming an attractive design. In another article in the Tupelo Journal, the paper records the following story. In 1981, Genevieve Stark bought an old home on Lampkin Street in downtown Starkville because she couldn’t bear to see it destroyed. Room by room, chimney by chimney, window by window, the entire home was dismantled, its pieces numbered and hauled away. A year and half later, the house had been put back together and restored to its former grandeur on property owned by the Stark family on Highway 82 west of town. At the time, Stark’s four children were all younger than 8, with the baby in diapers. She decided to name the home for them: Caroline, Andrew, Randolph and Genie. She would call it The Caragen House. The Caragen House is the only example of a Steamboat Gothic-style home in Mississippi, Stark said. 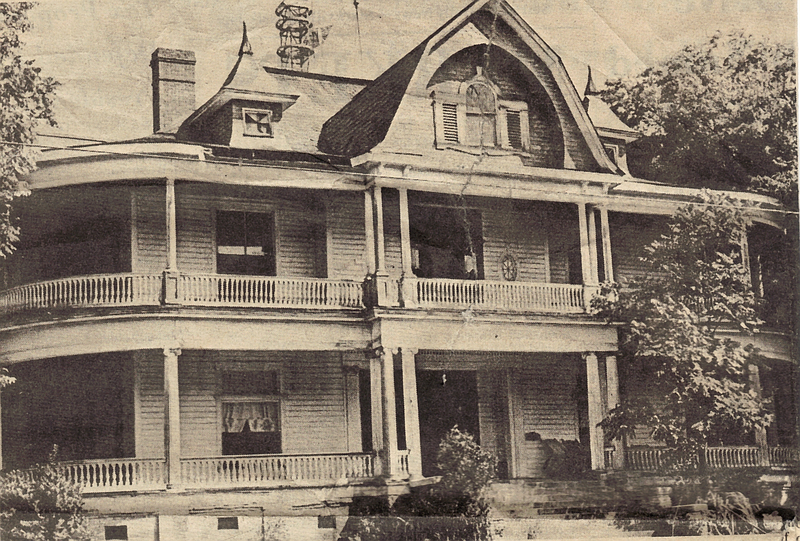 Build around 1890 by one of Starkville’s founding fathers, William Oliver Page, its two-story wraparound porches resemble a steamboat, while the slate roof is of a Gothic architectural style. After rearing her children in the 7,000-square-foot home, Stark sold it to Kay Shurden, who turned The Caragen House into a bed and breakfast in 1995. Downstairs, the home boasts a large foyer, library, parlor, dining room and butler’s pantry. It also has a sunroom with a 26-foot high ceiling, a utility room and a bedroom and bath. Shurden added a commercial kitchen in 1998 to make entertaining easier for large parties. The second floor is home to four spacious bedrooms and five bathrooms and a large foyer. Transoms top almost every door in the house and leaded glass sparkles from windows. Every bedroom in the home has a coal-burning fireplace, but only the ones downstairs are in working order. The third floor, a full attic that has not been finished out, adds another 3,000 square feet to the home. Now to the next life. In the 10 years Shurden has had The Caragen House, it has seen weddings, bridal showers, rehearsal dinners, business meetings, private parties and university functions. Over the years, she said, the likes of publishing mogul Steve Forbes, Govs. Lamar Alexander, Haley Barbour and Kirk Fordice and journalist Bob Woodward have come through her doors. “I’ve really enjoyed having this business and it’s been good for me but it’s time to stop,” Shurden said. This past November, she ceased to operate as a full-service B&B, although she will still occasionally rent to overnight guests or she’ll rent the house for a party, but she doesn’t “do” the parties anymore. She’s even entertained the idea of selling the home. After Stark moved home to Starkville from Florida recently, she briefly considered buying The Caragen House back. She recalled the years she spent researching the Victorian styles that were popular at the time the house was built and the attention she gave to wallpapering and painting rooms the way they would have looked in the 1890s when the home was built. She knows the ornate Italian-style mantels in the downstairs formal rooms are not original to the house, because she found two layers of wallpaper beneath them in the early 1980s. She guesses they were installed at a time when money flowed more freely, likely just before the Great Depression. Through the years she lived in the house, she got caught up in the details of its history, of its former life.